The Amorphophallus konjac is back for another year, and for the first time has produced multiple leaves, which is exciting. The main leaf is at least double the size of last year's. 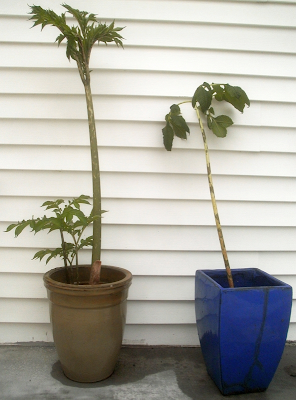 In addition, 2014 is seeing the premiere of Amorphophallus bulbifer, which I got from a reader. Its leaf came up first, before there was enough light for it, and as a result the petiole was stretched and floppy. It also had a mysteriously bad spider mite infestation flare up just before I put it outside for the summer. But these things do happen, and it didn't seem likely to affect the plant in the long term, so I was willing to roll with it. Last year, there had been a problem with the A. konjac blowing over in the wind, so this year, I prepared for that by setting both plants in tall, heavy cachepots. And that lasted for maybe four days. Left: A. konjac. Right: A. bulbifer. I guess the leaves are going to die then. I suppose that means the tubers are gone too. Oh well, I thought, suddenly nonchalant at the prospect of losing plants I'd been very happy about a few days prior. 1) If the leaves did die, does that automatically mean that the tubers will die too? Will they try to make replacement leaves? If so, should I be cutting them off now so that the tubers can send up a (hopefully sturdier) replacement before the summer's over? 2) Should I be trying to, I dunno, put a splint on the petioles or something? I figure sticking in an actual stake is probably no good (since any stake shoved into the soil next to the petiole will hit and maybe damage the tuber), but I could surely find something to attach to the petiole to keep it straight, if that's something I should be doing. EDIT: The species name is actually A. bulbifer, not A. bulbiferum. PATSP regrets the error. First, my experience with these places is pretty much nonexistant, but if the leaves aren't dead If leave them be for now. If the konjac is sensing up multiple leaves, those are most likely offsets, so even if the main tuber periahed, there is another one to continue. I'm given to undertake that these are understory plants in rathet dense forests, so its not surprising that the door seem adapted to any sort of wind... they are native to very protected and still habitat. Ive always been intrigued by them. Have never had this happen to mine. However, mine get planted in June and as they sprout are already in full sun outside. (Sun from around 8am to 2pm -- completely unobstructed.) This results in MUCH shorter, sturdier stems. (Upon seeing yours, my first thought was that they could have used a LOT more light.) Next year, if you have a full sun area, put them there and bake the crap out of them. As long as they get watered well, they can take it. I do not believe you will get a new leaf if you cut those off. Your larger corm may survive to try again next year though you would have a much smaller bulb. The other Amorph ... if it is a small corm, losing the leaf may very well kill it. 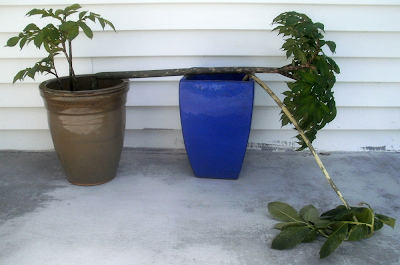 If they were mine, I splint them so that they are upright and that winds won't knock them over again. The extra leaves on your konjac, in case you were unaware, are from cormlets produced by the main corm. If you dig up the corms this fall, you should find the cormlets are completely separated from mom. I've had this happen to other plants before and splinting the bent stem worked more often than not. I wrapped tape around the break then staked the plant well. I remember most healing themselves after a week or two. A cat mistaking it for a scratching post, my own watering-negligence, and crazy windstorms have wrecked havoc on my Amorphophallus konjac. In each case the leaf died before the end of the season. And in each case the tuber (or is it a corm?) survived, albeit smaller. Also, those other leaves are probably from babies, not the same plant. The A. bulbifer was outside in the sun (maybe 3 hours of direct sun a day) last year, and it had 3 leaves throughout the season (only 2 at any one time, though, and the first month or two it only had 1 leaf). Some Amorphophallus do send up multiple leaves from the same corm--but I wouldn't cut the leaf off until it dies back completely, like tulips etc. And A. bulbifer's corm is large enough that if its leaf died and it never sent up a new one, it would still survive for next year. Just keep it watered every once in a while so the roots can take in some nutrients, and eventually it may get its act together to send up a new leaf--or, it'll store at least *some* energy for next year's growth. If the leaf dies back, you may wish to check on the corm every once in a while to ensure it's still solid and to see whether a new leaf is forming.